So You're Wondering "Can I Camp in the Adirondacks?" 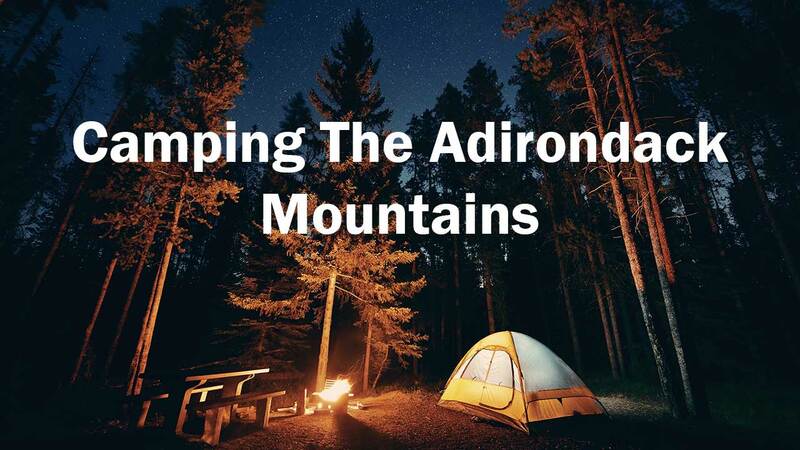 Yes You Can Camp In The Adirondack Mountains and Catskill Park! 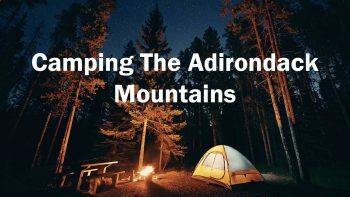 So you’re planning on going hiking in Adirondacks or Catskills and you want to go for more than one day and you camp out under the stars, who doesn’t right? But you want to know if it’s actually allowed. I can safely say YES YOU CAN CAMP in both parks. New York allows primitive camping at these wilderness parks. 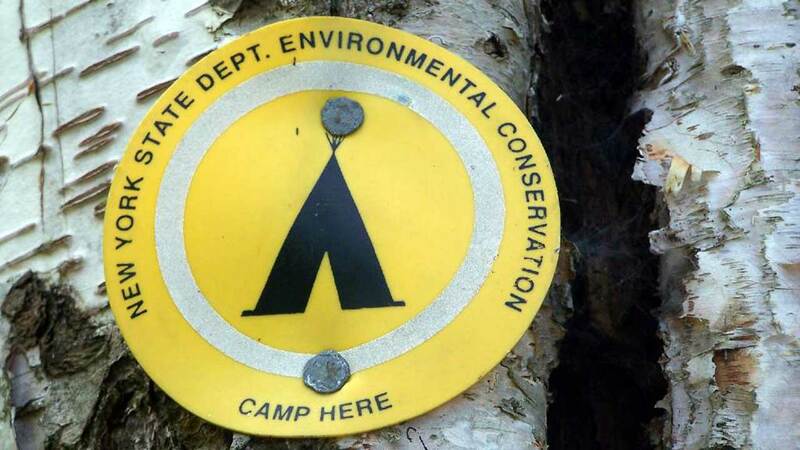 For the sake of crowding and nature the State of New York Department of Environmental Conservation would like campers to use designated camping site. The NYDEC creates sites that put about 1/4 mile between fellow campers, they select areas that offer nice scenic locations in areas folks will be happy campers. They also occasionally close some sites and create new ones to let an area recover from humans. Always remember to not leave a mess, carry out what you bring in and be respectful to nature and fellow campers. Primitive or backcountry camping is a popular activity in the Adirondacks. It involves camping in a tent or lean-to deep in the woods away from civilization. This type of camping offers few or no amenities such as running water, electricity, picnic tables, or restrooms. Primitive camping also requires you to backpack or paddle all of your equipment, food, clothing, toiletries and sleeping gear (sleeping bag, tent and pad) that you will need during your stay. The best place to camp is at designated primitive tent sites. These sites are typically flatter than other areas and have deeper, harder soils more resistant to heavy use and erosion, minimizing the impacts of camping. Many sites have nearby pit privies and rock fire rings. Campers are encouraged to use designated tent sites. They are often close to trails and provide views of ponds, lakes, streams or rivers. These can be a source of water when properly treated. 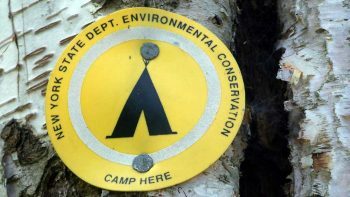 All designated primitive tent sites have yellow and black “Camp Here” markers. Many sites on lakes and ponds are identified by a yellow number against a dark brown wooden plaque typically attached to a tree near the water’s edge. Primitive tent sites and lean-tos are available on a first-come, first-served basis and cannot be reserved. If you find a tent site or lean-to with no people or gear, then you can camp there. Check the regulations for the area you plan to camp. Camping is allowed at designated sites only on some areas of Forest Preserve and Conservation Easement lands, and overnight use is prohibited in other areas. DEC’s website provides information on camping regulations for specific areas. Tents are not allowed inside lean-tos and must be at least 150 feet from the lean-to or on a designated tent site with a “Camp Here” marker. Camping for more than three nights or with ten or more people requires a permit from a Forest Ranger. Call 518-897-1300 to get the name and contact information for the local ranger. Please observe all State Land Camping and Hiking Rules. It is proper etiquette to share your tent site for one night if a second camper or group of campers arrives after dark, especially when it is raining, cold or windy. In the morning, the second group should pack up and leave to look for another location. Lean-tos should be shared by multiple parties until filled to capacity (normally 8 people). These situations are rare, but can happen in heavily used areas, such as the Eastern High Peaks Wilderness. Black bears are present throughout the Adirondacks and Catskills. Campers should store all food, garbage and toiletries in a bear-resistant canister or food hang. Bear-resistant canisters are required in the Eastern High Peaks Wilderness. Maps of the Adirondacks and Catskills can be downloaded, or are available from our central and regional offices. If you have a particular region in mind, try the Places To Go pages, which provide descriptions of individual properties. For recommendations, contact the forester or Lands and Forests staff person in the regional DEC office nearest to where you’d like to go. There are lots of bears in the Adirondack and Catskill mountains. Learn what to do if you encounter a bear, how to cook and store food at your campsite, and other useful bear-related information on the “Black Bears in New York’s Back Country” web page. Don’t bring firewood for your campsite from home. By transporting firewood, you could be unintentionally spreading diseases and invasive insects that can quickly kill large numbers of trees. Please help us stop the spread and obey the Firewood Regulation. Contacts for Local Information about Back Country Camping – Local forestry offices and forest rangers can answer backcountry camping questions for individual properties. This page originally appeared here.